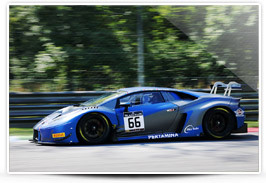 During free practice at Monza it was ISR that took top spot with a lap time of 1m47.858s in its Audi R8 LMS with Filip Salaquarda, Frank Stippler and Clemens Schmid. SMP Racing’s Ferrari 488 GT3 secured the quickest lap of 1m48.381s in the Blancpain pre-qualifying session. Car #72 driven by Victor Shaytar, Miguel Molina and Davide Rigon was ahead by just 0.011 of a second when the chequered flag was waved. 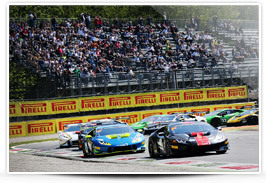 This weekend also hosts the Lamborghini Super Trofeo. GDL Racing’s car #7 driven by Jefferies Axcil Ramar and Rik Breukers started on pole and went on to win race one. Race two is at 11.20 tomorrow: Imperiale Racing’s car #23 driven by Jonathan Cecotto and Vito Postiglione will start from pole. Matteo Braga (Pirelli circuit activity manager): “Today the tyres were working well, with the top 26 cars, which featured eight manufacturers, within a second of each other in the free practice session this morning. 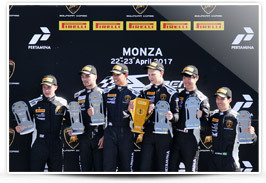 In the afternoon session, we saw the drivers concentrating more on race pace and set-up, especially as the warm weather conditions reflected what we are likely to experience for tomorrow’s race.” Luca Filippi (Attempto Racing, car 66, Lamborghini Huracan GT3): “I don’t think I’ve ever seen a GT championship anywhere in the world as competitive as this one, and where better to start than Monza? The level is extremely high, and from what we’ve seen so far it’s going to be very close in qualifying. However, with all the teams trying different things today, it’s very hard to predict how exactly tomorrow will pan out.” Fact of the day: Andy Soucek from Spain will feature on the Pirelli Facebook Live broadcast (Facebook.com/PirelliMotorsport) tomorrow following the start of the main race at 14.45. He is one of the modern day ‘Bentley Boys’ driving a Bentley Continental GT3 in the Blancpain Championship. But previously he has tested in Formula 1 with Williams and Virgin Racing. Number of the day: 211. 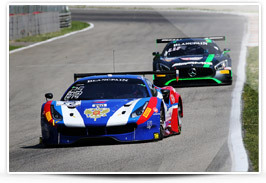 The number of drivers who will take to the track at Monza this weekend in both the Blancpain GT Series Endurance Cup and the Lamborghini Super Trofeo.